When I was in Mongolia I was looking for something a little different to paint up, but still on a nautical theme. I’d already ordered from Navwar some World War 2 Italian and French vessels, had the Battle of Jutland set as well as the Battle of Matapan set and had rounded those sets off with the Austrian and Italian fleets from World War 1 and the American and Japanese fleets from the Battle of the Philippine Seas. What would fit with all that and be a little out of the ordinary. World War 1 French came to mind as did the US and Japanese fleets from World War 1. I also thought about Greeks, Turks and other smaller navies from World War 1. Then I opened a book to read, Task Force 57: British Pacific Fleet, 1944-45 (Crécy soft cover), by Peter C Smith, which was about the British Pacific Fleet in 1944 and 1945. Perfect! Something slightly out of the ordinary and that would fit in with the Philippine Sea set. 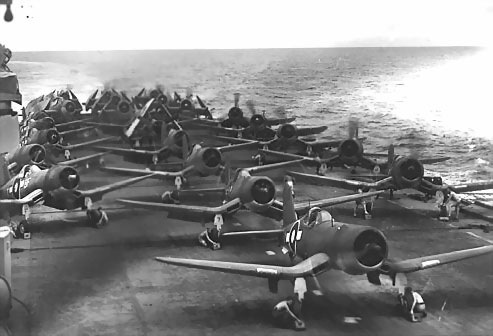 The British put together a fleet supporting the efforts against the Japanese in the Pacific. Whilst this fleet was somewhat smaller than the equivalent US fleets, it was still quite sizeable. The British Pacific Fleet was the most powerful conventional war fleet assembled by the Royal Navy. Its home base was Sydney. At the end of the war in the Pacific it consisted of four battleships, eighteen aircraft carriers, eleven cruisers and many destroyers, auxiliaries and so on. OK, that is as far as I got. I know that the British Pacific Fleet also included a fair number of Frigates, Sloops, Corvettes and Submarines but I did not get around to purchasing them. The last thing I purchased was aircraft – lots of 1/3000th aircraft models. Originally I had planned on mounting these on stands to show incoming air attacks as well as the Combat Air Patrols over the fleet but I got to thinking that the aircraft components are better handled by using 1/1200th models – so I’ll get around to purchasing some of them in the future. In the meantime, all the aircraft I did purchase will go on the decks of the aircraft carriers. For the record, I’ll add the extra ships here along with the Navwar codes thatI have found for anyone looking to add the extra ships. I have not included the Fleet Train, Landing Ships, Oilers and such here – buy Smith’s book and look them up – there are a lot of vessels there. Hehe – good to see that you check in on what's happening around here. Drop me a line to my email address and let me know what's happening. Thanks Calum. Yes, you are correct, I missed out the Vengeance – now added. Click the link for the HMS Vengeance website mentioned by Calum.